Today we took a drive on the Blue Ridge Parkway to one of our favorite villages, Blowing Rock, North Carolina. Our visits to Blowing Rock almost always end with Mr. Mickey and I enjoying a scoop of Kilwin's ice cream while sitting on a bench in the park across the street. Today I shared a bench with a scarecrow! This is the door of a stone church in the village. For some people, Sunday afternoon is a time to watch football. Shopping is a sport isn't it? Unfortunately, all of my shopping lately has been at Lowe's. Here's a peek at my new home. We stopped there on our way out of town. I will be moving my furniture in soon, but for now there is still more work to be done. Today I am wearing a dark purple sweater from Chico's with a lighter violet tunic from Covered Perfectly. This is my version of a sweater set. I don't care for those short clingy ones that you often find in stores. The necklace and brown ponte pants are also from Chico's. I now have my favorite Louise et Cie shoes in brown leather, black suede and animal print. They are so comfortable! You will find them only at Nordstrom. The bag is old. Thank you for reading my blog. I hope you had a lovely weekend as well! Our temperatures suddenly dropped to 26 degrees this week. The rapidly changing weather had me reaching for layers. For a Friday date night dinner with friends, I wore shades of teal with gray tweed pants. The first layer is a long sleeve tee from Talbots, next is a knit sweater from Dillard's, topped by a car coat from Geiger. The gray tweed pants are from Ross. The necklace is silver and teal from Chico's. The black short boots and black and silver bag are from TJ Maxx. These items are all old and you have likely seen them before but I have been trying to combine the pieces I have to create different looks. For example I have been wearing the long sleeve tee with jeans and a long sweater vest for a very casual look. Pairing it with a similar color shorter knit sweater and necklace with tweed pants made it more appropriate for wearing out to dinner. I am also more mindful of the combinations and hues of color I wear now. I am very tired from a week of packing and moving and cleaning both houses as I go, so I could not have carried off the high contrast combination of sapphire and black for example. I would have "disappeared" behind the stark contrast of those colors. I hope these tips are helpful to you and that you have a peaceful warm weekend. A great looking tunic is always the number one item on my wish list every season. These fabulous tops layer well or stand alone for year round wear. I have been wearing my Covered Perfectly tops often. They are buttery soft and the fit is indeed perfect. They are machine washable for another huge plus. I am so excited new colors to choose from. (They are made in the USA) I want them all! The neckline is perfect to layer with jackets or vests! For a limited time, Fifty, not Frumpy followers can get a 20% discount on up to two items! Use the discount code FNF20 when you check out at Covered Perfectly. There are several styles to choose from and the discount will apply on up to two items, after that, you can take advantage of the buy 2 get 1 FREE special! Last evening Mr. Mickey and I attended a fun Gatsby event hosted by The Johnson City Area Arts Council (JCAAC). This is our regional arts council, dedicated to preserving and nurturing the traditional arts and cultural communities of Johnson City and the surrounding five county area. I try to dress age appropriate even in costume. Here I am in shades of gray and black again! Doesn't Mr. Mickey look handsome as a gangster? Arriving in this car would have been fun but it was just parked outside the venue for the event. The Rick Simerly Group entertained us for the evening. Our friends Tom and Joy McGinnis. Joy is a famous artist from right here in Johnson City. I don't think this gentleman sat down for the whole evening. It was such fun to watch him dance with all the ladies. Here he is doing the Charleston. Thank you for reading about our fun evening for a good cause. I hope you have a lovely Sunday! Mr. Mickey and I are charter members of a wine club. Last night we attended a tasting which included the Italian wines Baraolos and Brunellos. I am wearing a long black, red and cream sweater over a long sleeve red tee with a bold Asian inspired tassel necklace all from Chico's. The straight leg black pants are from Stein Mart a couple of years ago. The shoes are from Nordstrom. The bag is by Tahari via T.J.Maxx last year. Before the tasting I studied that large map of Italy showing all the wine regions on the easel behind me. Is head to toe black your "easy to get dressed without thinking about it" look? In the 1990's all black became the uniform for an easy dressing option for many women. In the Polyvore fashion set I created above, I selected items in different shades of brown but varying shades of any color would give the same effect. Color is just one part of my decision making process. As in all the tips I share with you, I will use myself for the example today. I like very much to wear soft flowing lines in a longer jacket or sweater. A simple cowl, oval or rounded V neck top works best with my round face and wavy hair. This neckline also gives my favorite necklaces a simple background. Another tip: When I wear a necklace, I wear very simple smaller earrings. If I wear a larger pair of earrings, I skip the necklace. Too much going on around your face is not flattering, especially since most of us wear glasses now. Speaking of glasses, a squarish frame in a softer gray or brown tone is much more flattering to my coloring and face shape. Since the top half of my body is larger and longer than the lower half I like to wear slim leg pants and shoes with a bit of a heel or wedge. This helps to balance the halves of my body. This is an example of a look that is easy and comfortable for me. I hope this post inspires you to think about details such as the lines, the drape and the cut of the clothing you wear as well as the color. If you understand how all the elements come together to flatter you, getting dressed is so much easier. If the colors in your closet all truly flatter your own coloring it is amazing how they also work together. This makes getting dressed in the dark almost possible. Thanks for joining me on this journey! I love hearing from you. On Sundays we leave behind our schedules and hectic lives to do something very peaceful or nothing at all. On this Sunday we took a drive down to the river valley. Our earlier plans of taking a drive upon the Blue Ridge Parkway yesterday were abandoned because of fog which lasted until late in the morning. 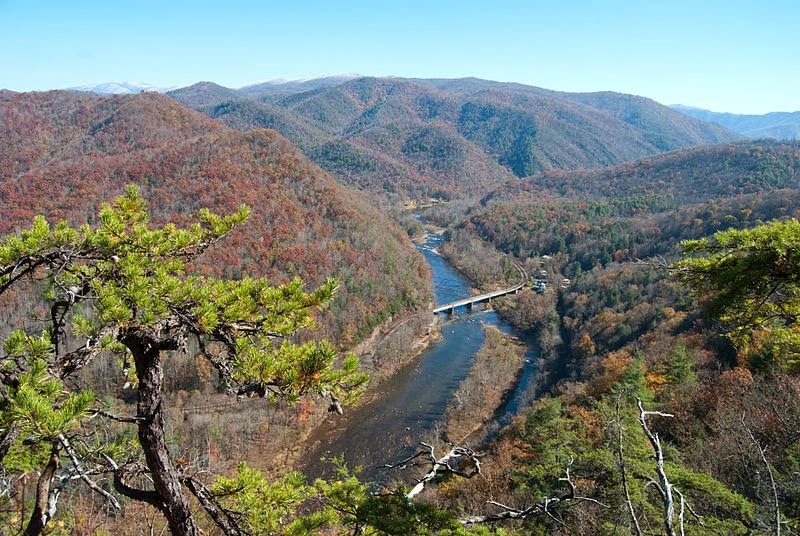 Instead we took a drive down to the Nolichucky River Valley as seen below from the Appalachian Trail. This rich and verdant agricultural valley is where a lot of our local produce is grown. It is a summer tradition to drive down to the river to buy local fresh vegetables and fruit. On this day we found lots of pumpkins at our favorite vegetable stand along with tomatoes, plants, tree bark birdhouses and other local crafts. I am wearing a Chico's jacket, necklace, tank and khaki jeans. The Vince Camuto animal print flats are from Nordstrom. Thanks so much for reading my blog and for all your kind comments. I hope you have a lovely week. Long jackets with flowing lines and minimal lapels have always been favorite articles of clothing for me so of course I adore kimono style jackets. Recently I received this hand painted silk kimono from Dalitika. You should have heard my excitement when I opened this package! The previous two weeks have been very hectic ones filled with many long days as I helped Mr. Mickey move into his new home and started to decorate it for him. (His previous home sold after only five days on the market!) Our aching bodies were ready for a day of relaxing so we went out for lunch and had a couple's massage at the Austin Springs Spa located in the beautiful Carnegie Hotel in Johnson City. This week on Facebook we have been discussing makeup techniques and eyebrows specifically. Have you noticed that when we are young, the brows are normally darker than the hair? As we start to color our hair or we let it fade to gray as I have done, we tend to forget this and try to make the brows the same color as our hair which can often make us look older or more tired. It is important to rethink your makeup techniques after forty. What worked when we were in our youth will make us look dated and not our best current self. For example when I learned to apply makeup, I wore a light color with a bit of shimmer under my eyebrows and a darker color in the crease of my lid. If I did that today, my eyes would appear to recede. The color I use under my brown now is a muted matte pink color by Merle Norman called Pink Truffle. I use a pale cream shimmer color only at the inner corners of my eyes now. A couple of hours after the massages, we were on our way to our favorite restaurant in the mountains of North Carolina. The Artisanal in Banner Elk is truly a world class dining experience. On this evening we dined on the terrace over looking a mountain stream at the edge of the woods. As dusk started to fall a great owl took flight from one of the trees and glided along the stream on his way to look for his own dinner. I was thrilled to catch a glimpse of this magnificent bird of prey! On this evening there was no private party in the wine cellar of the Artisanal, so we took the opportunity to do this photo shoot there. We have been in the restaurant when a helicopter has landed on the lawn to deliver special guests for dinner. Those who prefer total privacy go down to the wine cellar for their dining experience. The wine cellar private dining provides the ultimate food and wine experience in an unforgettable setting. They can accommodate parties of up to thirty-two guests. The owners, Anita and Bill will assist you in creating a memorable experience down to the finer details. Their guidance in planning every facet of your event to the menu selection, place cards, or floral arrangements, to any other special occasion needs, makes the tasks of planning a party feel effortless. The wine collection is massive, including more than a thousand bottles of fine wines. (Note that the floor of the actual wine storage area is pea-gravel.) There is a long glass wall which separates the diners from the wine vault but it is very pleasant to be able to view all those neatly stored bottles. The decor of the grounds and building are based on equestrian events, race horses and a barn. This massive poster is on the far wall of the wine cellar. With the fabulous hand painted silk kimono from Dalitika I am wearing a tank and a long necklace from Chico's. The ankle pants are from Talbot's. The shoes are by Guess and the copper beaded clutch is old. I got a new hair cut a couple of weeks ago. It is softly layered and a little longer on the sides so that I can tuck some of it behind my ears. I love you this much for reading my blog! Some of you have written to ask, "Where are you?" I have been helping Mr. Mickey (my photographer and partner in life) to move into and get settled in his new home. My old home is still on the market so I am in the process of packing and also doing a few projects at my new home. Recently our "date nights" have consisted of manual labor. I am so excited to show you my new home but I am a few weeks away from moving in. For now I will share with you some of the things that provide inspiration for me. This is Timothy Corrigan's LA home. 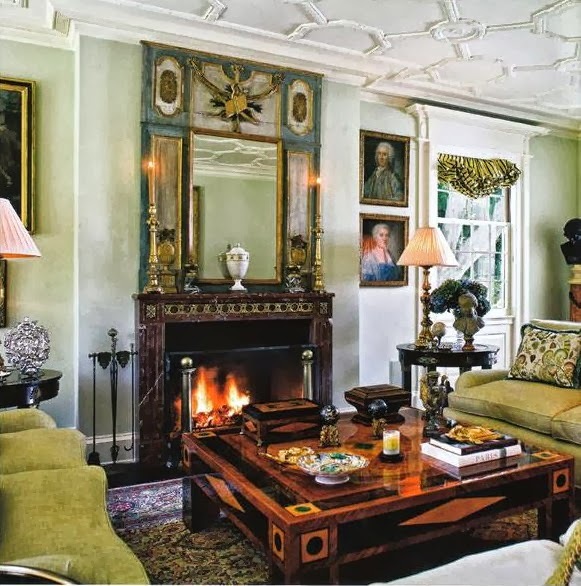 He has always been one of my favorite interior designers. 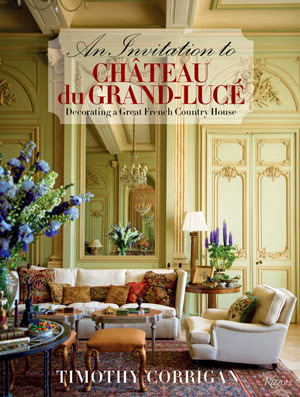 He has a new book just out, "An Invitation to Chateau du Grand-Luce". My copy is on its way! I look forward to curling up in front of the fire with this book and a glass of wine later this month to absorb every detail. I always study the classics to get inspiration and guidance for any project I undertake whether it is dressing, designing jewelry, planning my gardens or decorating my home. For example I love the classic timeless style of Jackie O and Audrey Hepburn. I also admire some popular young women who currently show their own strong sense of style. Olivia Palermo is one of those young women who constantly impresses me with the way she dresses. Below is a selfie of my casual look for today. I am on my way to the dentist and will be running lots of errands afterward. I am wearing a long sweater vest and a long sleeve tee with a long tassel necklace all from Chico's last year. The jeans are Levis dark wash. The shoes are Vince Camuto. Mr. Mickey and I are looking forward to a normal date night on Saturday so perhaps on Sunday I will have a fashion post to share with you. Thank you so much for reading my blog and for your kind comments. I truly enjoy interacting with you!